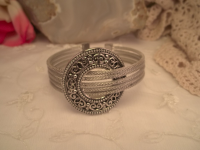 Designer Inspired Antique Silver Tone Cuff Bracelet is beautiful. 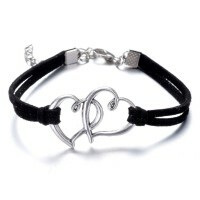 The circle part of the design measures 1 3/4"
Black Braided Cuff Bracelet is made of real leather and silver studs. It fastens with one adjustable snap in the back adjustable from 8 inches - 9-1/2 inches. The width is 1-1/2 inches. Stunning! 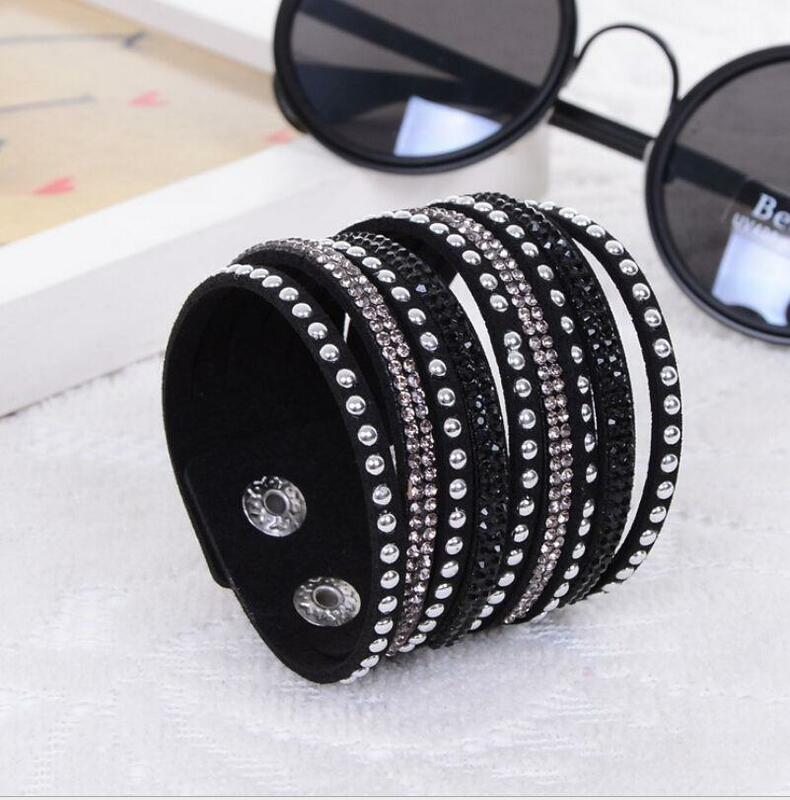 Black Leather Diamante Cuff Bracelet is made of real leather with black, clear and gray rhinestones. It fastens with 2 adjustable snaps in the back; diameter is 7.87 inches or 9 inches. The width is 1-1/2 -inches. Gorgeous and fun! 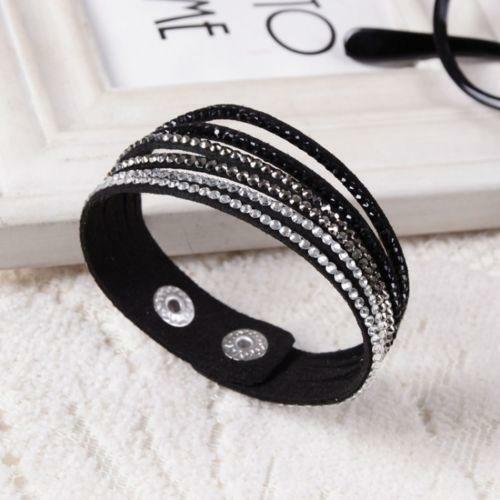 Black Diamante Cuff Bracelet is made of real leather with black and clear crystals. It is 1-3/4 inches wide. It fastens with two adustable snaps and is 7.87 inches - 8.87 inches long. Stunning! 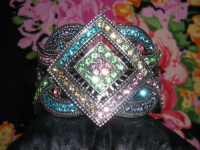 Blue and teal rhinestones cuff bracelet is retro in style. It is 2 inches wide at the center of the front. It hinges on the side. Stunning! 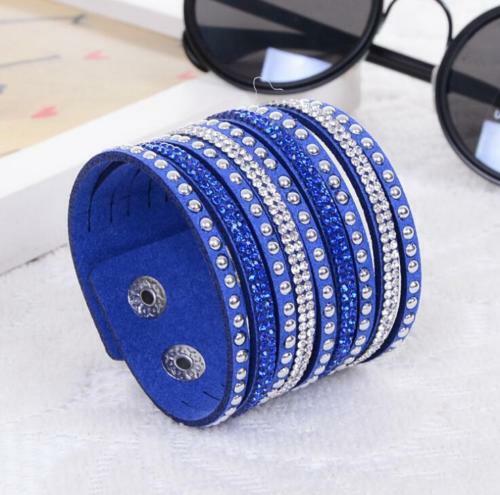 Blue Diamante Cuff Bracelet is made of real leather with blue and clear crystals. It is 1-3/4 inches wide. It fastens with two adustable snaps and is 7.87 inches - 8.87 inches long. Stunning! 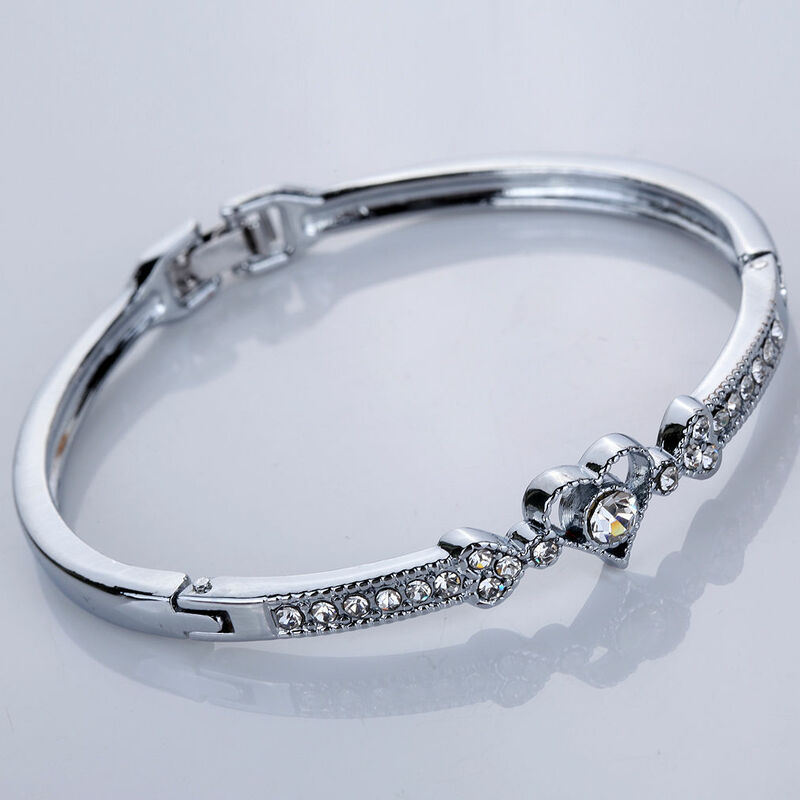 Swarovski Blue Leather Diamante Bangle Bracelet is made of real leather and rhinestones. 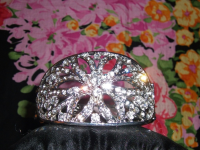 It fastens with 2 adjustable snaps in the back; diameter is 7.1 inches or 7.9 inches. The width is 1.4 inches. 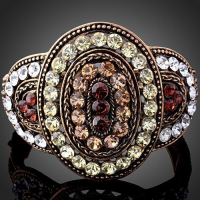 Shades of brown and clear austrian crystal cuff bracelet that hinges on the side. Stunning! 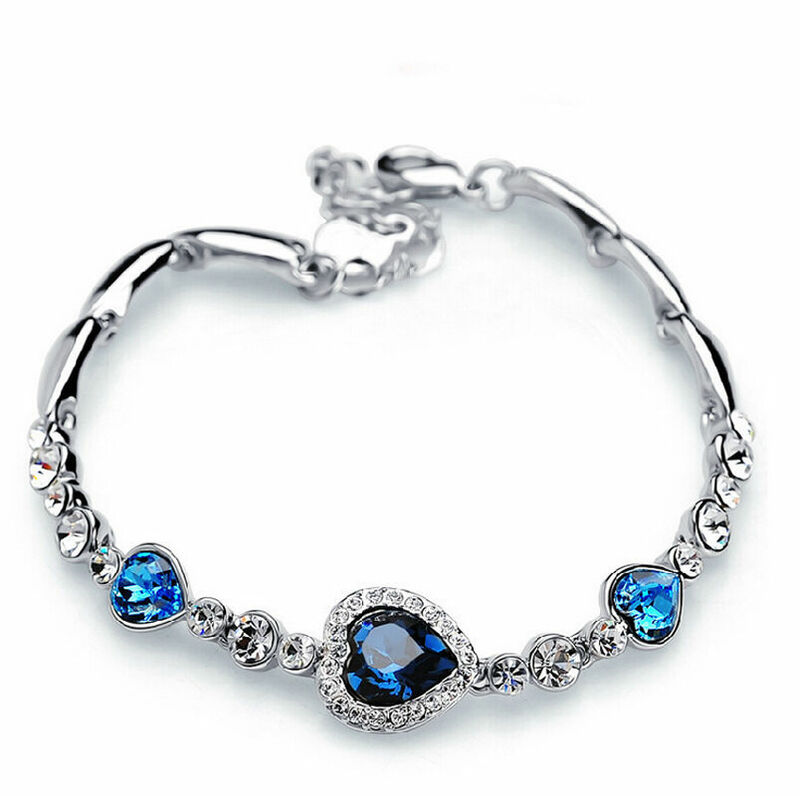 Gorgeous rhinestone bracelet has a spring clasp side closure. Beautiful! 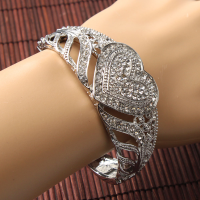 Vintage style clear rhinestone wide bracelet in s pattern with spring clasp side closure. Stunning! 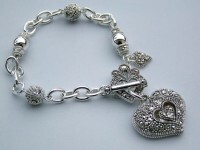 Silver plated delicate heart bracelet with crystals. Fits medium wrist. 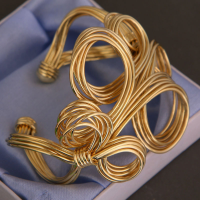 This beautiful gold plated, wire cuff bracelet is handmade. The center flower is 2- 1/2 inches wide. Stunning! Light blue Diamante Cuff Bracelet is made of real leather with blue and clear crystals. It is 3/4 inches wide. It fastens with two adustable snaps and is 7.25 inches - 8 inches long. Stunning! 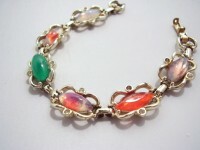 Chunky multi colored rhinestone bracelet with s pattern design has a spring clasp side closure. Beautiful! Peacock Blue Diamante Cuff Bracelet is made of real leather with peacock blue crystals. It is 3/4 inches wide. It fastens with two adustable snaps and is 7.25 inches - 8 inches long. Stunning! 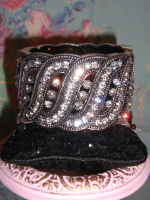 Pink Diamante Cuff Bracelet is made of real leather with pink and clear crystals. It is 1-3/4 inches wide. It fastens with two adustable snaps and is 7.87 inches - 8.87 inches long. Stunning! 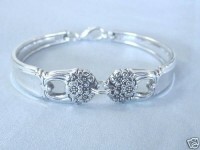 Beautiful stretch silver bracelet with purple rhinestones all around. 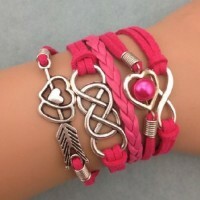 A fun bracelet! 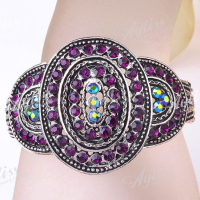 Vintage style purple rhinestone wide bracelet with spring clasp side closure. Breathtaking! 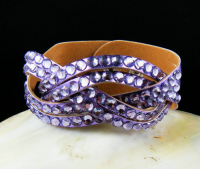 Swarovski Purple Leather Diamante Bangle Bracelet is made of leather and rhinestones. It fastens with 2 adjustable snaps in the back; diameter is 7.1 inches or 7.9 inches. The width is 1.4 inches. 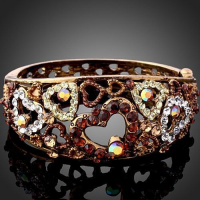 Rose Red Diamante Cuff Bracelet is made of real leather with pink and clear crystals. It is 3/4 inches wide. 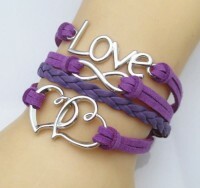 It fastens with two adustable snaps and is 7.25 inches - 8 inches long. Stunning! 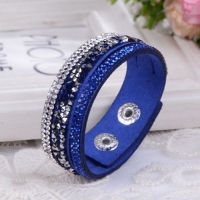 Royal Blue Diamante Cuff Bracelet is made of real leather with blue and clear crystals. It is 3/4 inches wide. It fastens with two adustable snaps and is 7.25 inches - 8 inches long. Stunning! 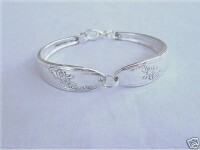 Spring Fork Bracelet from two Rogers silverplate forks. 2 inches wide in front with spring back. 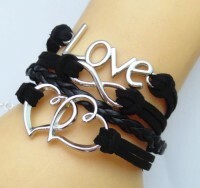 For a size 6-1/2 inch wrist. 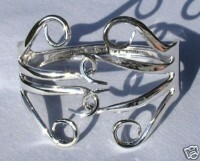 Handcrafted from 2 vintage silverware spoons. Spoons were manufactured by International/1947 Rogers in 1941. The pattern is Eternally Yours. Measures 7--1/2 inches but can be made larger by adding extra links. A crystal between spoons can be added for $10 additional. Your choice of clear ab, medium pink or red. Handcrafted from 2 vintage silverware spoons. Spoons were manufactured by Oneida Tudor Plate in 1946. The pattern is Queen Bess. Measures 7--1/2 inches but can be made larger by adding extra links. A crystal between spoons can be added for $10 additional. Your choice of clear ab, medium pink or red. 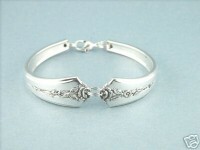 Handcrafted from 2 vintage silverware spoons. Spoons were manufactured by Holmes & Edwards in 1949. The pattern is Spring Garden. Measures 7--1/2 inches but can be made larger by adding extra links. A crystal between spoons can be added for $10 additional. Your choice of clear ab, medium pink or red. Handcrafted from 2 vintage silverware spoons. Spoons were manufactured by William A. Rogers in 1904. The pattern is Vintage Grapes. Measures 7--1/2 inches but can be made larger by adding extra links. A crystal between spoons can be added for $10 additional. Your choice of clear ab, medium pink or red. 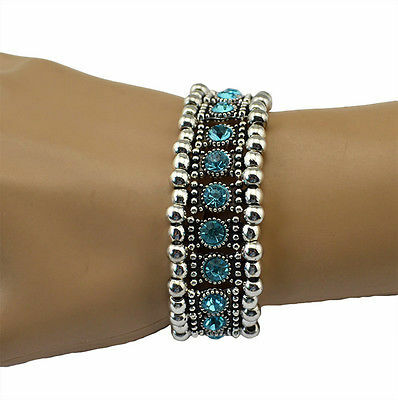 Beautiful stretch silver bracelet with teal rhinestones all around. 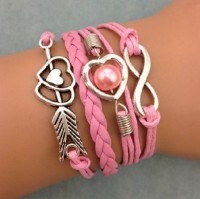 A fun bracelet! 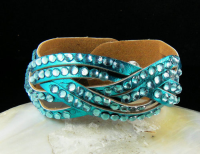 Teal Diamante Cuff Bracelet is made of real leather with teal and clear crystals. It is 3/4 inches wide. It fastens with two adustable snaps and is 7.25 inches - 8 inches long. Stunning! 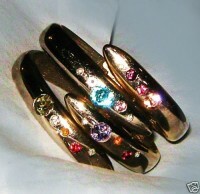 Gold clamper bracelet has blue, red and green rhinestone accents. Hinge is in the center of the back. Perfect with any outfit! 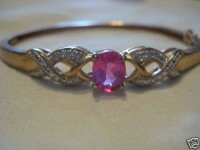 Gorgeous gold vermeil which is gold over sterling silver bracelet has pink rhinestone and encrusted clear rhinestones. Clasps on the side. 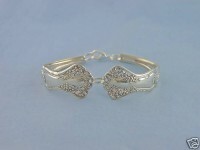 Gorgeous gold clamper bracelet encrusted with beautiful colored and clear rhinestones. 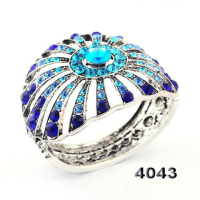 Would fit a small to medium wrist well. from the 60's to 70's era. Vaired opalescent glass cabochon surrounded by gold open design. Sarash Coventry is a collector's item. Emmons, no longer in business, was founded by Charles Stuart in Newark, NY. He also founded it's sister company, Sarah Coventry. Sarah Coventry jewelry was sold at home parties in the 50's. Will only increase in value.